Blood and bone marrow transplants can be used to treat blood cancers such as leukemia. The transplant can provide a cure when the donor immune cells attack and kill leukemia cells. Unfortunately, the donor cells often also attack the patient’s own tissue, causing serious short- and long-term consequences. To prevent these negative immune responses without inhibiting the anti-cancer effect of the transplant, our strategy is to also give patients a dose of regulatory T cells (Tregs), which suppress the negative immune responses. Initial studies with Tregs have been promising, but there are many challenges to using Tregs as a therapy. A challenge in Treg cell therapy is to develop methods for the isolation of a homogeneous population of cells that remain stable following clinical scale in vitro expansion. To overcome these hurdles, we developed methods to isolate Tregs from a novel source: pediatric thymus. We found that thymus-derived Tregs (tTregs) have numerous advantages over Tregs from peripheral blood or umbilical cord blood including their abundance, ability to be isolated solely based on CD25 expression and potent suppressive function even under inflammatory conditions. Since thymuses are routinely removed during pediatric cardiac surgeries, tTregs could be routinely isolated, expanded and stored until needed as an “off-the-shelf” tolerogenic therapy. The Levings Lab has been working with the West Lab from the University of Alberta on a BioCanRx funded project to develop GMP-compatible protocols to manufacture tTregs for cellular therapy. We have developed protocols for the isolation and expansion of tTregs using reagents that can be applied in the GMP setting. 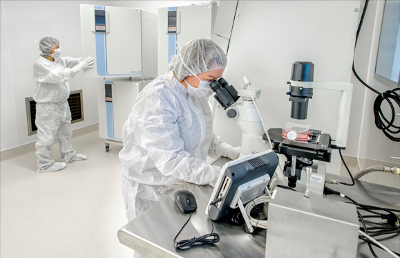 The next stage in our process development is the transfer of our cell manufacturing protocols from the research lab in Vancouver to the Alberta Cell Therapy Manufacturing (ACTM) facility in Edmonton which will perform GMP cell manufacturing for this project. Through the BioCanRx Lab Exchange program, I visited the ACTM in December 2018 to perform a full thymic Treg expansion in the process development lab of the ACTM. During this visit, I demonstrated our cell expansion protocol and Treg-specific assays to be used as part of the cell therapy product release criteria to staff at the ACTM. Working with the ACTM staff allowed me to identify aspects of our protocol that will require modification to be applied in a GMP environment and gave me insight into aspects of working a GMP facility such as documentation, release testing, and quality control. Our lab has limited expertise in clinical cell manufacturing, so exchange of knowledge between the ACTM and our lab is critical to our ability to finalize our protocol and transfer it to the GMP facility. I will be able to share the knowledge that I gained through this exchange with my lab to enhance our ability to design cell therapy protocols that can be easily transferred to a clinical manufacturing environment in the future. Katie MacDonald is a PhD student in the School of Biomedical Engineering at the University of British Columbia co-supervised by Dr. Megan Levings and Dr. James Piret. She is conducting protocol optimization and working with industry partners to test and optimize new, not-yet-commercially-available reagents and infrastructure for the manufacturing of thymic Tregs.